Heavy Duty Ultra Cotton T-Shirt. Prewashed to prevent shrinkage. High quality screen printing to allow years of excellent wear. Various colors and sizes available for quick delivery. 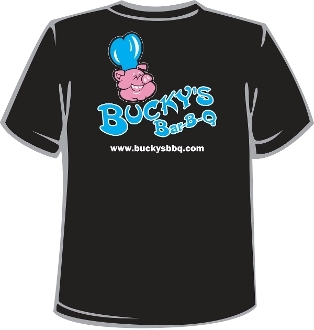 Bucky's color logo covers the full back of shirt (As Pictured) and the Bucky's name is on the front side in white. Various colors may be printed with a different color logo for the finest appearance.